Tell us more about Eze Castle Integration. Eze Castle Integration is the leading provider of technology, consulting and IT services to hedge funds and alternative investment firms worldwide. 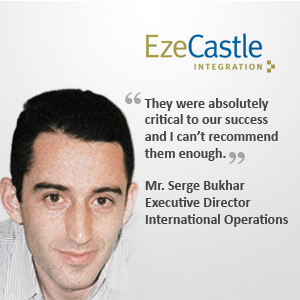 More than 600 firms rely on Eze Castle’s solutions, including 83 which are managing assets worth $1billion or more. Our IT services simplify the hedge fund launch process and increase efficiency at established investment management firms. Eze Castle’s products and services include technology consulting, outsourced IT support, private cloud services, project and technology management, professional services, telecommunications, business continuity planning and disaster recovery, archiving, storage, co-location and internet service. Eze Castle Integration is headquartered in Boston and has offices in Chicago, Geneva, Hong Kong, London, Los Angeles, Minneapolis, New York, San Francisco, Singapore and Stamford. Why did you establish your company in Singapore? Eze Castle Integration is committed to establishing offices in the regions where our clients operate. Our expansion into Singapore was fuelled by opportunities in the local market as well as interest from current clients who either had offices in Singapore or were looking to expand there. With an office in Singapore, we can provide our clients worldwide support for all their operations. Having a single worldwide technology partner such as Eze Castle Integration is very important and valuable to our hedge fund clients. Eze Castle Integration is committed to providing premier quality IT services, cloud computing and technology solutions hedge funds and investments firms require worldwide. To this end, we are focused on expanding internationally into new markets and introducing new technology products and services. We came to know of Rikvin through London-based Ferguson Snell. We have recently established an office in Singapore and needed to build up our local manpower as well as transfer a few people from abroad. Rikvin has been instrumental in getting all our Singapore Employment Passes and providing immigration advice during this time. We hit a few walls over the year due to the tightening of the Singapore work visa but Rikvin was able to successfully guide us through the various roadblocks and was able to push through every single Employment Pass application. They were absolutely critical to our success and I can’t recommend them enough.